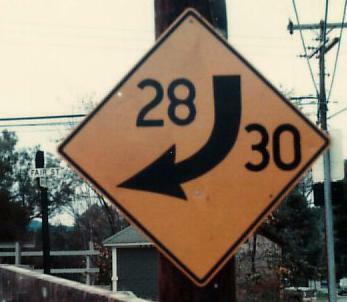 NY 28 is a horseshoe route. 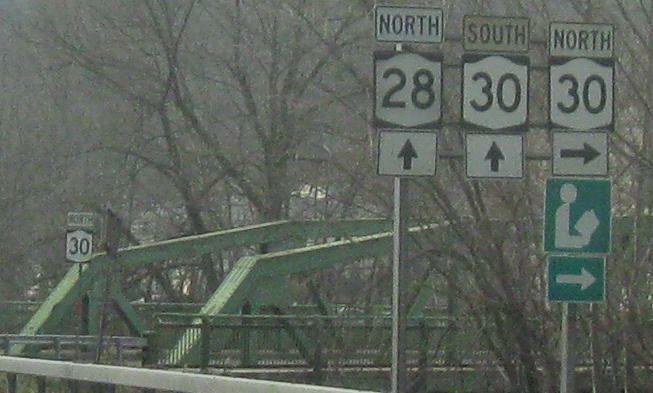 Beginning as an E-W route in the original capital of New York, Kingston, it heads westward (first with I-587), then cuts north to I-88, changing directions to N-S at Margaretville (NY 30). At this point, the originally WB NY 28 is multiplexed with EB I-88 between Exits 14 and 17. But wait, there's more. Getting tired of this charade, NY 28 turns back E-W again to end at Warrensburg, north of Glens Falls. At this point, NY 28 EB, which started out WB, is facing almost south again. You could follow it straight onto US 9, south to US 9W, down to Kingston, and start all over again. WB at NY 30 and then, courtesy Doug Kerr, Main St. SB at Fair St. in Margaretville next to this duplex, a county sign with the old New York font that would never meet state standards. It appears to be a regular old (i.e. tapered-arrow) curve sign that has merely been misappropriated.